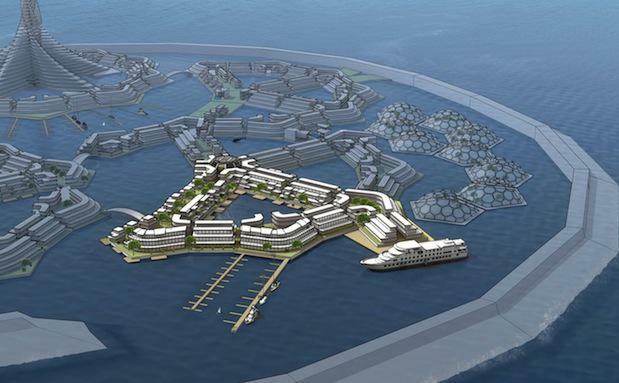 Self-sufficient floating cities with autonomous governments floating several kilometres from the coast line. Is this the new frontier to combat rising sea levels and global warming? According to one ambitious American organisation, it may just be so. Established in 2008, the Seasteading Institute is a not-for-profit organisation formed to promote autonomous, mobile communities that float and operate in international waters. Seasteading communication director Joe Quirk recently told ABC News that the first prototype floating city could be built and operational by 2020 with a population of up to 225 people. "We hope that if we can set an example, provide some jobs and create some eco-cities that float in the shallow territorial waters, we'll set an example and show people that seasteads can be of benefit to the world," he said. According to the Quirk, structures like Shell's floating LNG platform Prelude, which is bigger than the Empire State Building and designed to remain at sea off Australia's west coast for 25 years, are paving the way. The floating cities are also opportunities for what Quirk calls "start-up governments". "When you consider that nearly half the world's surface is a blank slate, unclaimed by existing governments, you see the potential in creating a thousand start-up governments in the sea," he said. According to Wikipedia, seasteading is the concept of creating permanent dwellings at sea, called seasteads, outside the territory claimed by the government of any standing nation. Most proposed seasteads have been modified cruising vessels.